Many of us incorrectly call our home loan a mortgage, but in fact, a mortgage is not what your lender gives you to buy a home. A mortgage is actually the formal document proving the legal claim or lien on a piece of property that you give to the lender who holds it as security for the money you borrowed. The lien is recorded in public records. On a mortgage, you pledge the property as security for the repayment of your loan, but you do not transfer title to the lender. If you (the mortgagee) repay your loan in accordance with the terms of the mortgage, it is canceled or satisfied by the lender (the mortgagor). However, if you do not repay your debt, the lender has the right to sell the secured property to recover funds through a court proceeding called foreclosure. 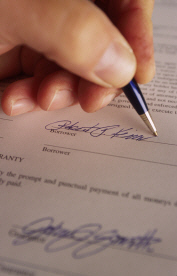 In some states, a deed of trust is used in place of a mortgage. While a mortgage involves two people (the borrower and the lender) a deed of trust involves three people - the borrower (or trustor), the lender (the beneficiary) and a trustee, a neutral third party, such as an attorney or a title agent. The deed of trust is also recorded in public records. In a deed of trust transaction, the borrower transfers the legal title for the property to the trustee who holds the property in trust as security for the payment of the loan to the lender. The deed of trust is cancelled when the debt is paid. However, if you default on your payment of the loan, the trustee may sell the property at the request of the lender without a court proceeding.